ITV has been awarded Channel of the Year at this year's Edinburgh television festival. The broadcaster was recognised for the success of crime thriller Broadchurch, which drew a peak audience of 8.9 million viewers. Broadchurch won the New Programme award and its writer Chris Chibnall was named Industry Standout Talent of the Year. Channel 4 won Channel Breakthrough of the Year for its disability awareness campaign following the Paralympics. The award for Programme Innovation also went to the Channel 4 for The Undateables series. 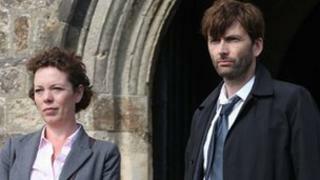 Earlier this month it emerged that ITV's Broadchurch is to be remade for a US audience. The drama about the mysterious death of an 11-year-old boy was a ratings hit for ITV earlier in the year and won critical acclaim. Olivia Colman starred as detective sergeant Ellie Miller alongside David Tennant as detective inspector Alec Hardy, investigating the death of Danny Latimer in a fictional seaside town. The climax of the investigation, which was screened in April, was watched by a peak audience of 8.9 million viewers.